Neo4j is a graph type of NoSQL database developed by Neo Technology. Are provided in the dual license version of the open source and commercial packages. The three basic components of nodes (vertices), relationships (edges), a property called (attributes), the data type of the graph model to represent the relationship between the nodes is an object. And have been optimized in order to obtain the answer of the query path and the index, such as “Find the shortest path” “looking for a friend of acquaintance” “looking for a friend,” for example. To find a relationship like this in RDB, but they require a lot of computation for (Join) bond can be processed at high speed graph with nodes of several billion, relationships, and property in Neo4j. Read the original article. 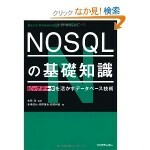 (Japanese) Buy the book at Amazon.co.jp. well written article. I will make sure to bookmark it and return to read more of your useful information.